Art of Fugue & Canonic Variations. Jaroslav Tuma is a Czech player of all historical keyboard instruments, including clavichord. He has a special interest in restoring and recording historical organs, and a large discography in Supraphon's series Historical Organs of Bohemia. 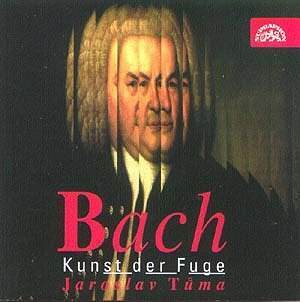 He has been fascinated by The Art of Fugue since student days and has concluded that the organ is the most legitimate medium to express all its qualities. He decided however that for this particular work, the organ in Ceske Budejovice built by Slajch at the end of the 20th C. (there is a confusion about dates in the English translation!) is the only suitable instrument in Bohemia, because most historical instruments there have limited range and lack some essential notes in the lower octaves of manuals and pedals. These performances are notable for clarity and for the listener it is easy to follow the part writing. It is not made clear whether it is a tracker-action instrument, but there is a pleasing attack at the beginning of the notes, which enhances the characterful delineation of the interweaving contrapuntal voices. Tuma opts to omit any of the suggested completions of the last unfinished fugue and, instead, follows its breaking off with a chorale, Von deinen Thron. Two of the fugues, and Contrapunctus XIII & XIV, are for two keyboards, here using the moveable positive organ in the choir (Giedre Luksaite-Mrazova). This very satisfying CD is completed with the Canonic Variations on Vom Himmel hoch (BWV 769), another glory of Bach's last years, submitted as an annual requirement for retention of membership of a learned society in Leipzig. This masterwork combines contrapuntal learning with lyrical melodic writing and is one of Bach's most imaginative organ compositions. The documentation is unusually complete, with a page of facsimile, a good photo of the interior of the Church of the Divine Heart, specifications of both instruments and details of the registrations employed in each of the 29 tracks of the double CD. At Supraphon's reasonable price, it is highly recommendable.